MarkdownMom has been making her own list from Craigslist of local food sources. So far, she has found local vendors and producers of honey, wild rice ($6-$8 lb. ), and beef for hamburger meat($3.15 lb+). With rising costs of food due to demand and transportation costs (gas and diesel prices), it’s wise to look locally and to identify sources. Not only does it make sense as far as freshness and price, but it is a way to be able to survive any interruptions in supply. So, MarkdownMom recommends checking “general” and “household items” for sale categories on craigslist and making a list of these sources and contact information. 1. Post an actual picture of the item– don’t post a look-alike from a catalog. A buyer wants to see actual item–anything less suggests deception. Don’t post without pictures. Remove listing promptly when sold. Otherwise, you bring into question the legitimacy of your offer. If you list a phone number, list possible times when you will take calls to answer questions or to make an appointment. Include all measurements, details on condition of item, and color—we all know that an item’s color can vary from computer to computer. Specify acceptable type of payment–if cash only, state it. Remember, there is no such thing as too much information–be descriptive! In the long run this will conserve time and energy for both seller and buyer. First Come. This rule is particularly sensitive to MarkdownMom since she was recently a victim of this business bad manner. After sending several emails, the seller got back to her late on an item he had for sale and made an appointment to see the item the next day. However, MarkdownMom received a call from the seller that a party had just bought the item despite the appointment. If you make an appointment with a potential buyer and get another call, the proper thing to do is not to undercut your first buyer. Tell the second caller that you have someone who has an appointment to look at the merchandise and if they don’t buy it, you will get back to them. Proper manners dictate first come, first served. At the very least you owe the first party who called and made an appointment a chance to see the item before the second party does. Many times “dealers” will try to under cut a private party by trying to get in before the others. An arranged appointment takes precedence and involves a seller’s code of honor. Don’t play fair and you not only create bad feelings, and you come off as a real jerk! Plus you don’t know who the 1st buyer knows. Even On CraigsList Reputation and A Good Relationship With Buyers Counts! DEALS TO GOOD TO BE TRUE. Some deals that a buyer thinks are local are really scams especially when they ask for money up front. These scams will often provide only an email and will involve the “shipping” of a car. DO NOT SEND OR PUT UP MONEY SIGHT UNSEEN. LOCAL DEALERS MAY OFFER GREAT DEALS; However when you go to see the car–oops! It was sold two days ago, and they forgot to remove listing. This is a bait and many times if you phone them or email them ahead of time, they do not answer. LEADER CARS. Often dealers who are using Craigslist more and more have “leader cars” to bring you to their lot. This is not necessarily a bad thing, just make sure it’s there and hasn’t been sold already. MAKE SURE TITLE IS CLEAR. This is important no matter where or from you, you buy the car. Titles can be impaired because the car was in an accident. A dealer should be upfront with you about this because it affects the value of the car. GET VIN NUMBER BEFORE BUYING. This will enable you to research the history of the vehicle. It’s important to do this even if car is listed by the owner because he/she could be second or third owner of the vehicle. “ BY OWNER” MAY BE IN BUSINESS. Many people are going to car auctions and they are not always large enterprises, some may buy 1-3 cars and fix them up themselves for resale. Many small lots and individual dealers are picking up hurricane vehicles, etc. Just because vehicle is listed as being sold by “owner,” doesn’t mean they were the original owner. ASK IF EVERYTHING ON VEHICLE IS “ORIGINAL.” If repairs have been made, ask to see what they were and when. Also, when dealing with the seller, ask them if you can have your mechanic go over the vehicle prior to purchase. If not, walk away. MAKE SURE YOU DRIVE VEHICLE PRIOR TO BUYING. Be wary when owner posts vehicle and shows it, but says that the car is out-of-gas and he/she has to fill it up, so you can’t drive it that day. This really happened! Can you imagine posting a vehicle and not having it ready to be driven? KNOW THE DEALER & GET INFORMATION. Ask friends, family, and even other dealers if they know whether or not the person you are dealing with is reputable. You would be surprised how other dealers not only know what their competition is like, but also know history of individual cars being sold in their target areas. SEE A GOOD DEAL, ACT ON IT IMMEDIATELY, some deals can be had from Craigslist and you have to act quickly; however, this does not mean you forego all of the steps listed above. Remember Markdown Mom’s post on Tip Of The Week #58: 3 Ways To Save That Shopping Network Item For Later Purchase in February when she was waiting to see if her top on waitlist would come in? Well, it indeed did! Of course, getting this item way beyond the 45 days on waitlist was due to the designer carrying over the popular top into the next season. But this recalls another item that Markdown Mom wanted from Pottery Barn that was reduced and sold out. However, the style was carried over into a new season, but not in the color that she wanted. Never say die, she went on Ebay and found the item in the color that she wanted for around the same sale price. This brings up another bargain fact of life: there are entrepreneurs out there that will buy up clearance items from designer retailers like Pottery Barn for later sale on Ebay®. Sometimes this is done on an item-by-item basis, sometimes it is a jobber buying all the overstocks. What is important to remember is to keep frequent tabs on the stock of an item especially if you are hoping for a better price. If you get skunked and the item is sold out before you can purchase it–check on Ebay and if really desperate, it doesn’t hurt to post a ” wanted to buy” listing on Craigslist; however, take measures so that the crazies and the spammers won’t inundate you. Tenacity & Patience Are Not Only Virtues, Sometimes They Pay Off! Although Markdown Mom is relatively a new fan of Craigslist, having not had this service available in her area until recently, nonetheless there are a few insights she has garnered from using this service. A great site for selling items locally or statewide. This allows for flexibility in your customer base. Oftentimes, smaller cities or towns do not have the pool of customers to get the response you want. Depending on the size of your state, a seller can list an item(s) locally or in the nearest largest city that can increase the amount of money realized from its sale. As a seller you must be prepared to answer phone calls or emails, this can produce a deluge of inquiries depending upon the popularity of the item and the asking price. Unlike Ebay, this will take up your time and most, not all, inquiries may not be productive, and even with more serious inquiries, “no shows.” Remember there is no buffer between the seller and buyer, these are one-to-one deals. To limit the number of calls, be sure to give as much description as possible. As a buyer, if you are looking for a specific item you can either list a “wanted item” in the category that item would be placed or in the “Wanted” category on Craigslist. Markdown Mom recommends doing both. Check items for sale once a day and if interested respond quickly, time is of the essence, if you really want to get to the bargain before others. Craigslist for the bargain hunter is much like attending an estate sale or a good garage or yard sale, the early bird catches the worm. If you are a seller, list everything like size, be specific and if necessary take measurements, condition, flaws especially if you don’t provide a photo–you can never give the buyer too much information. Include your email or phone number (times available to take calls). Markdown Mom prefers email since it allows seller more control as to his/her time allocation to this endeavor. PROVIDE PHOTOS. Although you can still try to sell item without it, a picture as they say is worth a thousand words especially since you are competing with auction sites, online sellers, all of whom provide photos. Don’t have a digital camera? Ask a friend, remember sites like Craigslist are taking the place of Ebay online stores that use to do this for you at a percentage of the sale. Seller be sure to specify means of payment, cash and money orders preferable, local checks with ID is up to you. Find an item that you wanted, but missed out on? Don’t hesitate to inquire on Craiglist as to possibly of purchasing it from the party that bought it off of Craigslist. You won’t get the bargain he/she did, but if you really want it you can negotiate the price provided that buyer is open to reselling. Some bargains are picked up by dealers with the sole intention of reselling. Since you know what they bought it for you know where to start the bidding price, but allow for a decent profit. Unless this is one of a kind, expect that the most to pay for it is 2½ times what they paid. This is also a good place to find FREE items, or to list items for FREE. Sometimes the owner just wants to get rid of the item for a number of reasons: downsizing, redecorating, or declutter. FREE does not always mean junk. If you are handy at refinishing, repairing, reupholstering, or trying to help out a friend who is in need, don’t pass this by. Make sure that you can get the item home. 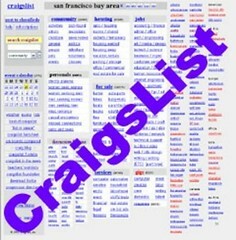 Some sellers will offer to deliver for an extra fee and Craigslist does list fee-based delivery sources in your area. If you live in a small town and have a friend or relative in the city where you find an item you’ve been looking for ages for, see if they will act as your proxy and check it out, pick it up for you, or store it for you until you can retrieve it. Don’t have them store it for very long as this is one sure way to lose a friend or tick off that family member. When you sell the item, REMOVE THE LISTING FROM CRAIGSLIST IMMEDIATELY. If you haven’t sold it, consider looking at the price you are asking, lower it and relist. A decent item should only need to be advertised twice at the most, so be sure to look hard at the price you want, compare it to others being sold, and initially price the item right. A fair price is not necessarily the amount of money you currently need to get, but what the market will bear.